Researchers believe that the planets are temperate, meaning they could have liquid water; this may be the best place outside of our solar system to look for life. This discovery outside of our solar system is rare because the planets have the winning combination of being similar in size to Earth and being all temperate, meaning they could have water on their surfaces and potentially support life. "This is the first time that so many planets of this kind are found around the same star," said Michaël Gillon, lead study author and astronomer at the University of Liège in Belgium. 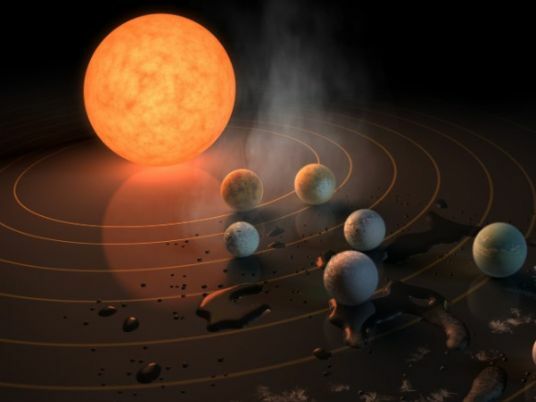 The seven exoplanets were all found in tight formation around an ultracool dwarf star called TRAPPIST-1 (after a telescope called Transiting Planets and PlanetesImals Small Telescope) Estimates of their mass also indicate that they are rocky planets, rather than being gaseous like Jupiter. Three planets are in the habitable zone of the star, known as TRAPPIST-1e, f and g, and may even have oceans on the surface. The researchers believe that TRAPPIST-1f in particular is the best candidate for supporting life. It's a bit cooler than Earth, but could be suitable with the right atmosphere and enough greenhouse gases. If TRAPPIST-1 sounds familiar, that's because these researchers announced the discovery of three initial planets orbiting the same star in May. The new research increased that number to seven planets total. The TRAPPIST-1 star system with Planet Earth drawn in. The "ultracool dwarf" star has seven Earth-size planets orbiting it (artist's rendition, CNN). "I think we've made a crucial step towards finding if there is life out there," said Amaury Triaud, one of the study authors and an astronomer at the University of Cambridge. "I don't think any time before we had the right planets to discover and find out if there was (life). Here, if life managed to thrive and releases gases similar to what we have on Earth, we will know." "This discovery could be a significant piece in the puzzle of finding habitable environments, places that are conducive to life," said Thomas Zurbuchen, associate administrator of NASA's Science Mission Directorate. "Answering the question 'are we alone?' is a top science priority, and finding so many planets like these for the first time in the habitable zone is a remarkable step forward toward that goal." And as we've learned from studying and discovering exoplanets before, where there is one, there are more, said Sara Seager, professor of planetary science and physics at Massachusetts Institute of Technology. Seager and other researchers are encouraged by the discovery of this system because it improves our chances of finding another habitable planet, like Earth, in the future, by knowing where to look. On TRAPPIST-1f, the star would appear three times as big as the sun in our sky. And because of the red nature of the star, the light would be a salmon hue, the researchers speculate. The researchers believe the planets formed together further from the star. Then, they moved into their current lineup. This is incredibly similar Jupiter and its Galilean moons. The researchers believe that TRAPPIST-1f in particular is the best candidate for supporting life. It's a bit cooler than Earth, but could be suitable with the right atmosphere and enough greenhouse gases. "I think we've made a crucial step towards finding if there is life out there," said Amaury Triaud, one of the study authors and an astronomer at the University of Cambridge. "I don't think any time before we had the right planets to discover and find out if there was (life). Here, if life managed to thrive and releases gases similar to what we have on Earth, we will know." Life may begin and evolve differently on other planets, so finding the gases that indicate life is key, the researchers added. The seven planets of TRAPPIST-1 compared with Mercury, Venus, Earth and Mars. What the TRAPPIST-1 planetary system may look like. In July, the team was able to determine that two of the closest planets to the stars had atmospheres that were more compact and comparable to those of Earth, Venus and Mars by observing starlight through the planets' atmosphere. Although 40 light-years away doesn't sound too far, it would take us millions of years to reach this star system. But from a research perspective, it's a close opportunity and the best target to search for life beyond our solar system. "If we learn something now, it can determine if we looked in the right place," Gillon said.